Ebony magazine has selected eight black women who earned or are completing their Ph.D.s from programs in the IU School of Education at Bloomington and Indianapolis as Ebony Power 100 honorees, an award that recognizes individuals who lead, inspire and demonstrate through their individual talents the very best in black America. n a letter to the women, Ebony managing editor Kathy Chaney wrote: "Because of your accomplishments and commitment to the community, you have been chosen for this prestigious list." The eight women are Jasmine Haywood, Demetrees Hutchins, Tiffany Kyser, Shannon McCullough, Nadrea Njoku, Jada Phelps Moultrie, Juhanna Rogers and Johari Shuck. Six of the women -- Haywood, Hutchins, McCullough, Njoku, Rogers and Shuck -- were in the School of Education's Bloomington-based higher education and student affairs program and took courses on both campuses. Kyser and Phelps Moultrie were in the urban education studies program in Indianapolis. This year's honorees will be featured in the December 2016/January 2017 issue of Ebony magazine and will be recognized at the fifth annual Power 100 Gala, which will take place Dec. 1 in Los Angeles. Ebony magazine has honored the heroes of the black community for over 70 years. The Ebony Power 100 celebrates the world's most inspiring African Americans from various sectors as standout achievers in their respective fields. Robin Hughes, executive associate dean of the School of Education, applauded the selection of the women, who call themselves "the Great Eight," for the Ebony honor. "I know they want to change the world, and they should. I expect great things from them." "What these women accomplished is a big deal," Hughes said. 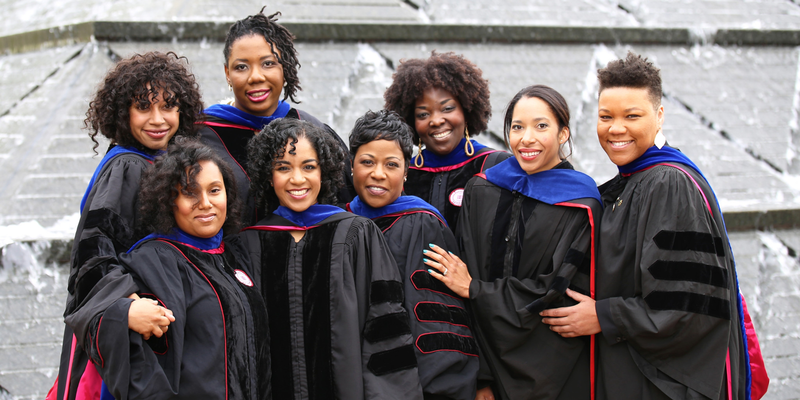 "It's rare when the School of Education graduates three or four Ph.D. candidates in one year, and usually there might be one or two people of color in all disciplines earning a Ph.D."
"To graduate eight African-American females from one school is amazing," Hughes said. "And not just for IU, but across the country, that just doesn't happen."